Grenada Beaches … What really happened on Levera Beach? Of the many popular Grenada Beaches, Levera Beach was the one that I had never visited. It’s only 5 minutes drive from Bathway Beach, so I had our tour guide make this one of our stops. But sadly our visit was cut short. When we pulled up there was absolutely no one to be seen anywhere. It was totally deserted, we had all of Levera Beach to ourselves. And this beach is beautiful. 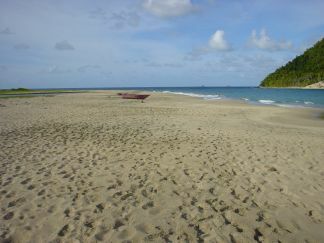 Except for the few fishing boats, and the footprints on the sand you will think this beach was untouched. 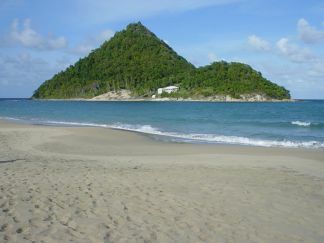 The view of the cone shaped sugarloaf island, is incredible. And it looks like someone lives on it. I wonder what life is like out there. Levera Beach is a santuary for turtles, and other wildlife. We decide to walk over to the logoon area to explore. We were about 100 metres away from our SUV when I heard an alarm. At the same time a speed boat was passing by, so the others all indicated that it was not the SUV alarm. But a minute later I heard the alarm again, and by this time our tour guide agreed with me, and begun runnig towards the SUV. 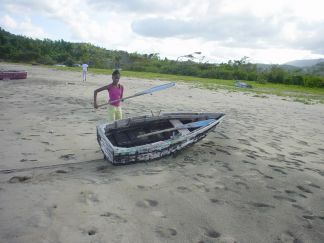 Here is Ryian posing with one of the oars from a fishing boat. Notice our tour guide pictured in the background running towards the SUV. I soon joined him in pursuit. And caught up with him right at the SUV. He got there just in time to see someone dissapearing into the bushes. The SUV appeared intact and the doors were all still locked. But no longer feeling safe, we signalled to the others to join us. While we were leaving, Ryian discovered that she was without her purse. In it was her Visa Buxx card, and her Tiffany Braclet given to her by her grand dad. She was certain that it was on the back seat next to the window. After much searching we concluded that the intruder must have gotten to the purse through the back window, which was not all the way up. On our way into Levera Beach we did pass two guys loading a blue pickup truck. Could they be the culprits? We returned to Bathway Beach, and told the vendors what had happen. They indicated that there is only one road out, and that the guys in the pickup were still back there. They also told us that this was not the first incident of its kind where those same guys were suspected. Our guide got in touch with one of his police friends about what had happened. We continued on with our tour, and counted the purse as lost. When we got home we called back to the US and cancelled the Visa card. So yet again, I was denied the opportunity to explore Levera Beach fully. It’s a beautiful place, and I plan on visit again. Do not go there alone. Groups are best. Make sure doors are locked, and windows rolled all the way up. I’m planning on driving up to Levera Beach some time soon for some post exam relaxation with friends, but on reading the issues with crime; I’m having second thoughts. Has anyone been there recently? Between late last year and early this year? Do you think it’s safe to go there now? GRENADA is so BEAUTIFUL that these sites can not get stale of visiting. GRENADA the best in the CARIBBEAN and the WORLD . Visit us someday. I just read the sorry story about the thieves on the beach. My husband is from Grenada, and we had the same experience x 2,. Since this island is so small, everybody knows everybody! Well, I am happy to announce that the “thieves” I believe there was 3 of them in total were just arrested this week (Jan.2010). They caught them with cell phones, jewelry,etc. So, if anyone had something stolen, maybe this is the time to give the police a call! I luckily enough, did not get anything stolen! The police also retrieved the devices that were allowing them to break into the cars easily! My husband actually chased them into the grape vines! Thank you for that update. I am happy that these guys were finally caught. Hopefully more will be done to improve the security in that area.